Late in 1939 a young German officer approached his superiors with a new idea, a novel weapon that could defend their bombers from attacking fighters. The officer was (possibly) Lieutenant Karl-Heinz Stahl from Kampfgeschwader 51. His bright idea was to fit a flamethrower in the tail of the bomber and when an attacking fighter closed up give it a dose of fire! This was presumably to force the fighter to break off its attack, or even set it on fire. Design and development continued until several test flights were carried out at Tarnewitz in February 1940. A later flamethrower, in Romania in 1944. The first versions of the device had a single nozzle, but later ones had a pair of nozzles. 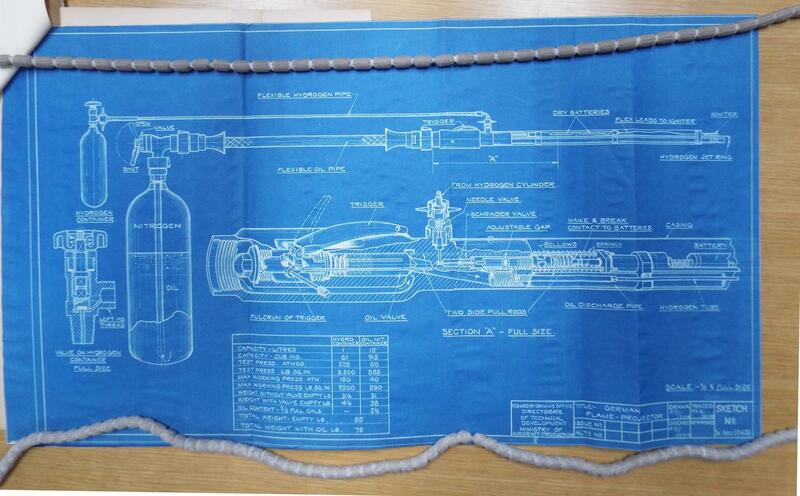 It was essentially a 1918 pattern flamethrower fed from a 24in long cylinder that was just 7in wide. This bottle contained 15 litres of fuel and was pressurised to 590lbs/sq.in. Hydrogen spark ignition was fitted. The fuel was nothing more advanced than oil. To fire the radio operator in the bomber pulled on a cable, which exited the cockpit, ran along the outside of the fuselage, and then attached itself to the firing mechanism. In tests a range of about 100 feet were achieved. It was in this guise the weapon was deemed ready for its first combat trial, over Britain. British plans of the instillation. On the 15th of September 1940, Eagle Day, the climatic day at the end of the Battle of Britain, nineteen Do 17's took off at 1000 from Cormeilles-En-Vexin, and headed towards London, their target was the marshalling yards at Clapham Common. These planes were all from KG76, and one, the rearmost plane was fitted with the flamethrower equipment. It was flown by Feldwebel Heitsch, with Fw Schmid as the radio operator, and thus in charge of the new weapon. The formation of Dornier’s approached London at 16,000ft, before the first fighter was spotted. A lone Hurricane closed in from astern, exactly in the prime spot for the flamethrower to attack. This Hurricane was flown by Sergeant Ray Holmes. At a range of 400 yards he opened fire. Immediately Fw Schmid triggered the flamethrower. HE-111 using the flamethrower during testing. There was one tiny flaw in the design. All the testing had been done at lower altitudes. 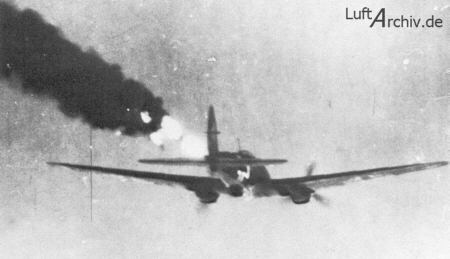 At 16,000 feet the air pressure was so low that the flame thrower failed to ignite the oil completely, and a small thin flame shot out the back of the aircraft. It did however spray the front of Sgt Holmes' aircraft with oil, momentarily covering his windscreen with oil and obscuring his vision. Sgt Holmes let the air stream clear his cockpit and as it did so he realised he was almost on top of the Do 17, so he pushed his stick forward and dived under the aircraft. As Sgt Holmes hurtled through the formation of Dornier’s he lined up on the next in line, firing repeated bursts at it, the crew immediately began to bail. The first man out had his parachute caught on Sgt Holmes' wing, so Sgt Holmes began several gentle manoeuvres to see if he could get the parachute to slip off, which it did. Sgt Holmes now found himself astern of a third Do 17, ahead of it lay Buckingham Palace, and the bomber was heading straight towards the King! Sgt Holmes opened his throttles, zoomed through the defensive gunfire from the bomber, extended out in front of it, and turned back in for a head on attack to try and force the bomber to break off. As he opened fire the first rounds came out then his guns clicked empty. 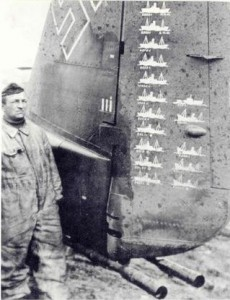 His attacks on the first and second Do 17's had used up all his ammunition. With nothing else to do, Sgt Holmes decided to ram the Do 17, he said he was aiming to cut through the tail, which he thought looked awfully weak, and rely on the sturdy reputation of the Hurricane. The impact destroyed both planes, Sgt Holmes and the German pilot both managed to bail out of their stricken planes, both were wounded in the chain of events. Sgt Holmes was hit by his own plane as he bailed out and survived, but the German pilot was not so lucky. One of the iconic pictures from the Battle of Britain, a mangled Do 17 crashing to earth. This is actually the third Dornier that Sgt Holmes rammed. Back aboard Fw Heitsch's Do 17, Sgt Holmes' first burst had hit the starboard engine, causing a loss in power. The Dornier began to descend. He was set upon by several fighters, and each time they approached the flamethrower was triggered, with no negative effect upon the enemy. Indeed, it made the Do 17 look like it was far more badly damaged than it was, and the huge black cloud of flame and smoke stood out serving to attract more fighters to her position. Another shot from testing, this time in a Do 17. The Do 17 crash landed just after 1200 near Shoreham. Fw Schmid, the radio operator had been badly wounded in the repeated attacks and died shortly after the bomber landed. The other survivors of the crew were captured by the local Home Guard, and seeing the shocked nature of their captives they were taken to the nearest pub for a pint before being sent to captivity. The Do 17's final resting place at Shoreham. You can see the flame throwing gear projecting out the tail. One would presume the casualty is Fw Schmid. The flame throwing gear along with the aircraft was salvaged, and an attempt was made to test fire the device. However, the horribly complex firing system meant that despite several attempts to repair it the time and effort were not seen as useful. The gutted Do 17 was used as an attraction to raise money for the Lowestoft Spitfire fund. An account from the official report on what went wrong with firing tests on the flamethrower. Thats an amazing story - loved reading about it. Thanks, it all fell together from the start.